My favorite time of the year is here, Halloween! Being born in October, I have had an obsessional love for Halloween since I was 5! I would pull out the Halloween box in August and run around at the end of summer wearing my Halloween costume. Outside of the States, Halloween is still quite a new holiday that is only slowly catching on. Usually when I start to talk about Halloween, it is answered with the question, “When is Halloween?” You can see I am alone with trying to celebrate it. 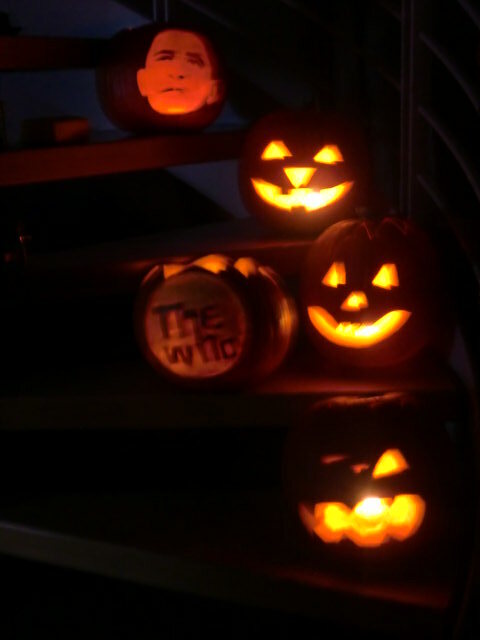 But I have started to make my own Halloween and this year I started celebrating with a Pumpkin Carving Party! It was very interesting explaining how to carve a pumpkin to my German guests. At one point the Americans were sitting on the floor carving and the German’s stood together talking about soccer! But with a bit of cinnamon apple cider and The Simpsons Treehouse of Horror Specials playing in the background everyone got their hands in their pumpkin. And they all turned out pretty spooky including the Obama one! To kick start my favorite holiday of the year I created these Raw Caramel Apples. They were so simple and delicious! I could not believe how similar they tasted to caramel! Blend all the ingredients in a blender until completely smooth. Scape down the sides of the blender and rock the blender to help the thick caramel blend completely. 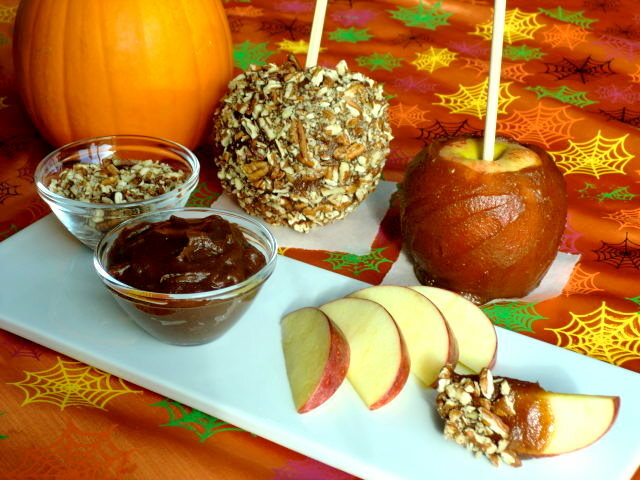 For 4 Caramel Apples, stab each apple with a stick. Empty the caramel in a shallow bowl and rotate each apple in the caramel. Use a butter knife to smooth over the surface of each apple. Pat each caramel apple with crushed pecans if desired. For Caramel Apple Slices, empty the caramel and crushed pecans into separate bowls for dipping. Serve with sliced apples. This entry was posted on October 17, 2010 by Olive. It was filed under Uncategorized . I’ve been eating apple slices with almond butter recently but these look a great alternative! Are you kddiing me? YUM!!! This looks amazing. I’m heading to the gym this morning and am thinking I’ll head to the store on the way home to get the ingredients. I run & workout to eat! Seriously, this looks SO good! And your crust looks fabulous. If I make the coffee, we gotta get together so I can learn how you do it. Kim ~ Recipes To Run On recently posted.. The maca powder inhances the caramel flavor and smell. And the dates do not need to be soaked before hand. They just need to be slightly warm so they cream easily. Love caramel apples, thanks for sharing this recipe!! YUM! These look soooo good! Perfect treat for Fall! Fall is my favorite time of year, I love Halloween too!!! Have a great bday! I made these last night. I am new to raw. Unfortunately, I didn’t have a very good day yesterday with most of my recipes. I had gotten a little discouraged, when I poured my dinner down the drain. :o( But I made these for dessert (dinner), and they were amazing! Recipes like this encourage me to keep trying. Thanks for posting! Wow! You could make everyone love Halloween with this display of goodies that look so delicious! Good Job Carla! The folks here at work say you should send this to the Oregonian Food Day and get published! They think you do such a professional job and they really encourage you to do this. Please let us know what they say! They are in awe of your pictures!